Last week was filled with reminders. Lessons I thought I learned long ago popped up throughout the week as humble taps on my heart that I am ever on the journey. Life has a way of talking to you if you leave spaces in it. I happened to be in line behind two women at the store. After looking at assorted fresh produce and herbs gathered to be rung up by the cashier, one woman asked the other women what she was going to make. As I walked out of the store a few minutes later, one of the women was writing down her recipe for the woman who had asked about the ingredients, their conversation laced with laughter. I shared tea and conversation with two amazing souls last week. We started our time together by simply sharing our life story with one another. As we talked, the other two women listened attentively, not asking questions, but simply being present. We left with an imprint from each other that will last a long time. 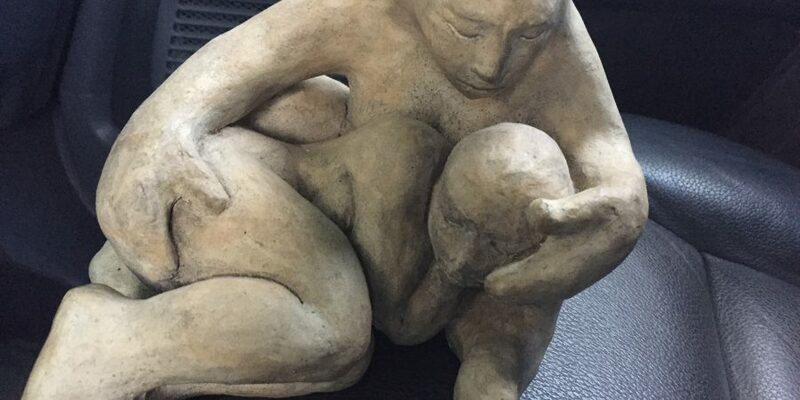 In a moment of anxiety, I was reminded of the sculpture a friend let me borrow during my recovery from surgery. Luckily, I took a picture of the sculpture before I returned it to her. It will always remind me of how I feel when I am listened to or loved by another person and how I hope I make others feel when I love them or listen to them. It also reminds me of how God loves us and how, I believe, we are called to love one another. In a world that is increasingly filled with too many screens and different ways of communicating that are marketed to us as taking less time and therefore giving us time for other things, I am convinced we are losing the ability to communicate face-to-face. It is the communicating with others in person that gives us practice to truly listen. It is listening that helps us to reflect and to grow. All of this points to one thing from my heart to yours: we need each other. Being with others in community is essential to wellness. Check out this TED talk for more inspiration. I hope you’ll take time to be present with another person. My hope is that you will have a conversation without a screen in the mix, and listen without a need to ask questions. See what it feels like and see how the other person responds. See how your heart feels afterwards. Can you imagine the gift of asking another, “Please tell me your story. I am listening.” In this week of heart celebrations, consider that as the gift you will give or receive. I could not resonate more with this writing Sarah. I feel that screen invading conversations and hope we will do all we can to preserve the face to face—with each other and with God. A friend of mine once said “approaching another person is approaching holy territory,” so we should surely give our full attention to such encounters.